For just this week, if you sign up for the Tagoras Research Community list — which is free to join — you will receive a complimentary copy of Association Virtual Events: State of the Sector. It’s a win-win! Don’t wait — the offer will expire at the end of this week (April 6 or so). If you’re not really in the profile for getting this report gratis, but you have a vested interested in finding out about the status of virtual events in the association sector, follow the link to see how you can get a copy. Tagoras does excellent research and is a go-to resource for association leaders. Check them out! How Does the Money Flow? As we noted in our summary of the aLearning Survey results, we were surprised by the number of respondents who didn’t know what percentage of the organization’s overall budget is dedicated to education. Perhaps the organization is so small that there’s just one pool of money from which everything is dispersed.Or some organizations have an education budget but the education staffers don’t have eyes on the organization’s overall budget, so they don’t know what their portion of it is. This seems supported by the fact that the respondents most in the dark about this percentage are those from the 10,000+ members served category. The bigger the budget, the more departments involved, the more people = the harder it is to get eyes on the big picture. Why is aLearning so fixated on these particular “don’t know” answers? Why is it so important to know how much of the pie your education function is apportioned? Because you can’t advocate for an increase in your budget unless you know how the money flows in your organization. And the data in this survey support this. Of those responding they don’t know what the percentage of their education budget is within the overall budget, only 40% report that they will be experiencing an increase in the next year. Here’s a fictional example of how knowing what the overall budget is, and how education fits into it, can help. Let’s say your organization serves 8000 individuals and you have an education budget of $180,000. You have only a vague idea of how other departments are funded, but no information on the organization’s overall budget. You have been providing educational events for many years, as education is a key benefit of membership. You’d like to add an LMS but the price — $50,000 upfront and $15,000/year afterwards is being met with resistance. You’d like these amounts to be funded through an increase in your education budget. You’ve taken the numbers to the executive director and board: you serve 35% of the membership through your education events, with an additional 20% as a result of your online offerings. You’d like a more robust system for tracking and scores so you can transition into a certification program sometime in the future (this, the board supports). So, overall, you’re serving about 4400 individuals with your elearning. The board responds by saying they need to devote their financial attention to other needs — including upping their marketing and increasing their research offerings. What can you say to that? “Don’t do it?” “You’re making a mistake”? You have no leverage. You don’t have a way of weighing the costs or comparing apples to apples. Now let’s say you know that your $180,000 budget is 10% of the overall budget. Even if they don’t tell you or show you the numbers, you can calculate that the overall budget is $1.8 million. This tells you that the $50,000 will increase your education budget to just over 12.7% of the overall budget. You also know you’re serving 55% of the membership, a number that could increase with the addition of the new LMS, given the feature set you’ve got your eye on. You now know that 90% ($1.62 million) of the overall budget is distributed across these general areas. When you look at the picture this way, you can begin to see that your request for $50,000 isn’t a huge one, not in the broader scope of the organization’s money flow — just under 3%. You can put all of this into context by saying that a 3% “cost of living” increase for your department is well spent. Even without knowing how much money the organization is planning to invest in marketing and research, you can now make the argument that even if you increase your membership participation by only 5% with the additional infrastructure, the investment will have proven itself to be more affordable than it might seem upfront. Finally, if your organization has education or training as a key component of its mission, strategy, purpose, or goals, you should be making the case that adding 3% to the expense line is a small investment for supporting your overall mission/strategy/etc. Furthermore, if research (in particular) isn’t part of the organization’s mission/strategy/etc., then you have even more evidence that the investment you’re requesting has perceived value. Determine the percentage of members served (and number of individuals, whenever possible, even for trade associations). Compare that number to your budget percentage. Although they might never become equal (and it might not be desirable that they do), be alert to any huge discrepancies. Review your organization’s mission, strategy, purpose, vision, goals, etc. for every piece of evidence that education and training are important and valued. Create your case. Use current or recent registration numbers, feedback, surveys, polls — whatever you can provide. Most of all, don’t put the competition down. In our example, we focused on how to make your case — not how to attack the other areas the board is considering funding. Those could very well be critical areas — more marketing, for example, could bring you more members and more registrations. More research could lead to more areas for educational development. Avoid trying to position your education needs above other needs. It’s a hard argument to make, will alienate possible allies who are tied to those causes, and — in the end — could cut you out of the conversation entirely, rather than perhaps give you at least a partial victory. Sure, some executive leaders prefer to keep financial information from their staffers (I’d wonder about that leadership… but then… maybe that’s just me). Tell your boss you’re just looking for the percentage of total dollars allocated to your function — just one number, and a percentage (rather than a hard number) at that! You’re not asking for full access to all of the organization’s financial records or accounting data. Find out if your organization must make its financial information public; if so, there are a number of Web sites that can provide that information to you. You might be surprised that the boss hands over the information without much of a squeak. Perhaps you don’t have it because it never really occurred to anyone that you might need it — or want it. So if you do get the percentage number without much trouble, wait awhile, then go back and ask for more info. You’ll never know what you might be given unless you ask. A few things about the recent aLearning Association Survey that you need to know, and that I need to get off my chest. I’ve already mentioned that I didn’t ask at least one question clearly enough to get numbers that could be used to answer a few other questions as well… something that will be corrected next time. Why Was the Survey So Short?? Everything aLearning does is the result of balancing what we can do ourselves, get for free or accomplish at minimal expense. There are a lot of reasons for this, and one of them is to demonstrate to you (practicing what we preach) what can be done with a shoestring staff and budget. So we use the free version of Survey Monkey for our surveys. This limits us to 10 questions, and requires that any sort of report breakdowns be done manually. Which is what we did to give you the results by category — I just see a summary of all responses or I can see anonymous, individual responses. No reports. I suppose we could have done a few surveys of more depth that focus on one area (and maybe we’ll try this in the future), but we’re also aware that you get requests to do a LOT of surveys… so we like to keep them short and easy to complete. Using the free version of Survey Monkey is also why we’re unable to automatically enter everyone who completes the survey into the drawing — and why you have to let me know separately that you’ve completed the survey and want to be entered. As with all things. We get what we pay for, and in this case, the price is still worth what we get in return. How Did You Decide What to Ask? Curiosity. We’re not motivated by anything else. We don’t have sponsors or advertisers or others who might have agendas, so we aren’t in danger of being wooed into asking questions that could support some hidden motive. In this case, we tried to ask questions that you might want to know about what others are doing. How Many Respondents Did You Get? As we said, too few respondents answered our call to offer what could have been a nice benchmark, unfortunately. We had fewer than 100 responses, and of those, some dropped out of the questionnaire before answering all questions. Why Did So Few Respond? That’s a good question and it has plenty of answers. We put the word out via the blog and through direct e-mails to aLearning supporters and contacts. Thanks to those of you who promoted the survey via your own blogs, Tweets, and other means, we saw a “lift” in the number of respondents. We’re grateful for the word-of-mouth attention we got, and hope to see this sort of support in the future. The endeavor isn’t large enough to afford other means of promotion, so we’re happy to see this sort of response. So what does all of this mean? Well, on the downside, fewer respondents than we would have liked means results that don’t provide reliable benchmarking. On the upside, we’re able to respond individually to the requests for information we get and otherwise form friendly bonds with the aLearning blog readers. We got enough responses to provide a broad picture of what various organizations are doing based on the size of the organization, and to look at the data from a few other perspectives as well. We don’t accept advertising and — despite lots of requests to allow guest bloggers who seem to want to promote some specific LMS or learning service — remain independent. Our independence means we can say what we want without worrying about alienating sponsors, advertisers, subscribers, clients, dues-paying members or other entities. The only agenda you’ll find at aLearning is advocacy for association learning leaders (aka: YOU). The smaller your organization, the closer you are to aLearning’s heart. So we don’t attract hundreds or thousands of survey participants. We often see several posts go by without a comment. But that’s okay. We’ll continue to provide what we can in the best way we can do it…. …and serving as an inspiration along the way, we hope! And though the summary of the results is now concluded (those of you who requested a report will get one soon), we hope this opens a dialogue — let us know what you’re doing that might not have been mentioned. Feel free to add clarity to any of the responses you gave that deems it. But how are associations and other non-profit organizations making decisions about which programs to pursue? Do they have a strategic plan? Do they have a different method they follow? Again, results were scattered. But, again, there’s a lot we can learn from taking a look at them. Many respondents didn’t seem to see a distinction between getting input from an education committee (just to use one example) from creating and implementing a strategic plan for the education function. Other organizations were quite clear about the differences, saying (for example) they were in the process of developing a strategic plan. So does it really matter whether you evaluate your programs in these ways or have a more formally created (and attended to) strategic plan? We were curious about this, and decided to look at what organizations will be changing in the next year next to whether they have a strategic plan (or follow the organization’s overarching strategy). See what you think. Does having a strategic plan make a difference? 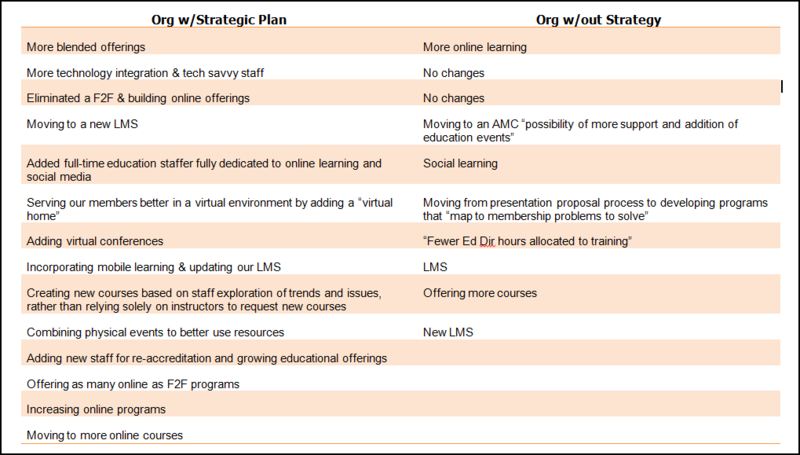 Certainly major decisions — about whether to incorporate an LMS or get a new one, for example — can be made without a strategic plan. But as you can see, organizations with a plan had a greater variety of anticipated changes — from implementing mobile learning to adding virtual experiences into the mix. Did you also notice that organizations with a strategic plan are adding education-dedicated staff members?!?!? One of the biggest challenges paid education staffers face is limited time. With only so many hours in a day, it’s hard to get everything done. So when the case can be effectively made to add personnel, it’s worth celebrating. Can such a case be made without an education strategy? Probably. And of course this survey wasn’t designed to try to show a causal relationship between having a strategic plan and being able to hire additional staff (or purchasing an LMS, or making other significant changes), but there does seem to be some relationship between them. So if you’re thinking you’re okay moving from event to event, making changes here and there, adding a program and subtracting one as the numbers seem to fluctuate… think again. Are you really moving your organization forward in leaps and bounds toward a clear destination, or inching it along to who knows where? Your organization is relying on you to lead them. Don’t let them down. 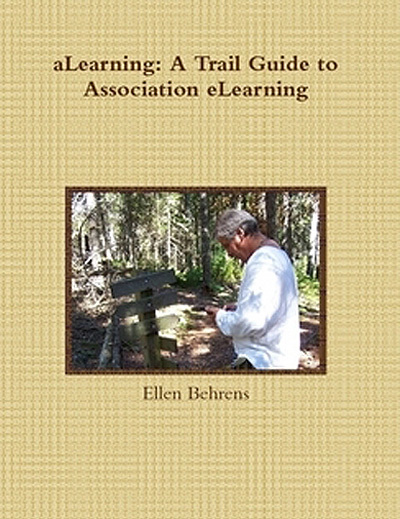 My sincere thanks to all of the survey participants, and special congratulations to Mary Beth Ciukaj, Director of Education for the Council of Residential Specialists in Chicago, who won a signed copy of aLearning: A Trail Guide to Association eLearning. More general comments about the survey next time, then I’ll put the survey and its results to rest.